A good fireplace is not just a device for heating the room - it is often a massive structure that becomes the central part of the interior. 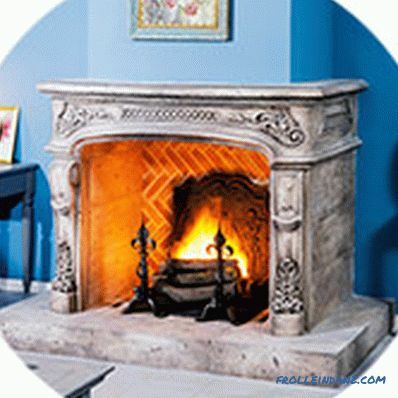 Although burning fire always attracts attention with the endless game of flames, the appearance of the hearth itself is no less important: built-in, near-wall, island or corner, in a classic version or one of the modern styles - these are only some types of fireplaces from which you can choose model. In addition, you still have to decide on the type of fuel and the design of the furnace - energy efficiency of the entire system will depend on them. 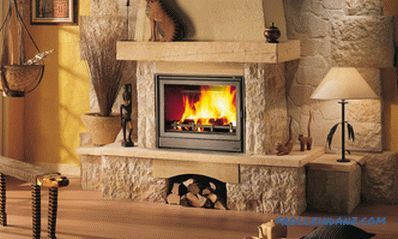 The choice of one of the following models will be determined primarily by the availability and cost of a particular type of fuel in the region, as well as the installation location fireplace - country house or apartment. 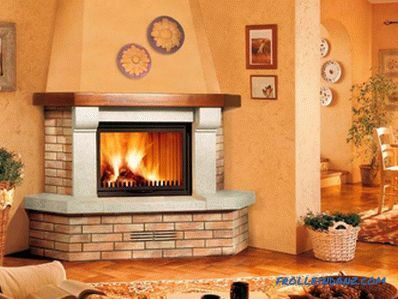 Another important point is the stage of repair of the room - if it is only planned, then it is quite simple to take into account the fireplace in the estimate, and if the repair work is completed or it is undesirable, then it will be problematic to install a fireplace with a chimney. The greatest difficulty in installing them is to properly make the chimney, on which the strength and stability of the draft depend. If it is too long, they will quickly burn firewood. If short, smoke and soot can get into the room due to insufficient air flow. As a result, specialists should deal with calculation and installation. The ideal option is when the hearth is laid when building a house, but if necessary, you can always find a solution to add it to an existing structure. The remaining details of such a fireplace are the firebox and the portal. In the classic version, fireboxes are made of an open type, when only a few ten centimeters of space separate the fire from the room. 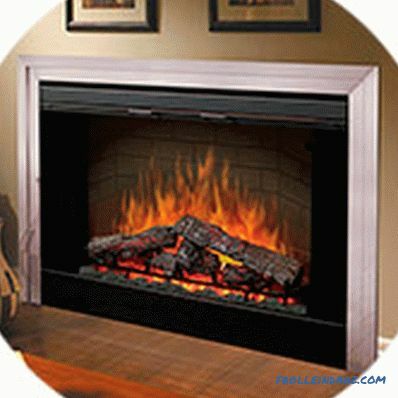 Closed fireboxes are considered more energy efficient and safe to use - a door made of tempered glass or ceramic is installed between the fire and the room, which withstands temperatures up to 800 ° C. Some manufacturers use technology "clean glass", which prevents the appearance of soot. Fire-resistant brick, ceramic blocks are used as a material for the firebox, or a ready-made construction of cast iron or heat-resistant steel is used. 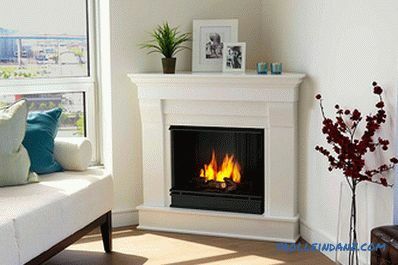 In addition to the design of the firebox, these fireplaces are not much different from wood fires - they also require a quality chimney, but they can work only when connected to the gas main (methane - natural gas). There are also mobile fireplaces that are relatively not difficult to transfer from room to room, if necessary, quickly heat one of them. 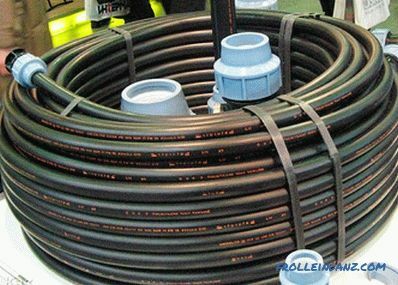 They can work either from a gas cylinder (on propane-butane), or for such models they carry out separate gas distribution lines, to which they can be connected in different parts of the house. 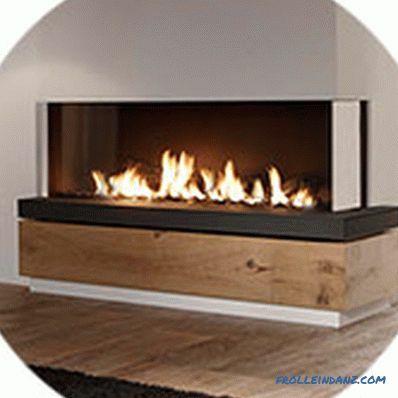 The advantages of gas fireplaces include quiet operation, the most rapid kindling, ease of operation and a high level of fire safety. In essence, this is a conventional electric heater, but stylized as a hearth. 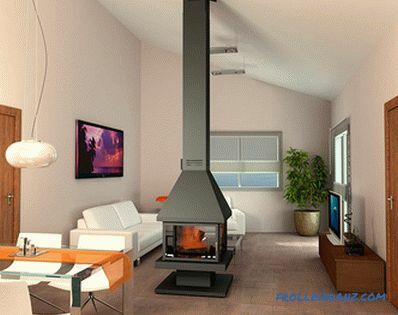 Since an open flame is not used here, the chimney is not required and, in general, the use of such a device is much simpler - this fireplace will work everywhere where there is a power socket and it heats up to a working temperature for a couple of minutes. 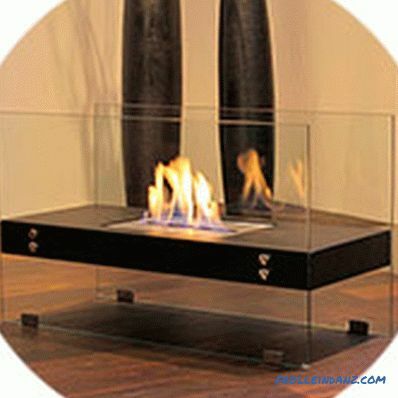 Such fireplaces are made in the classic outdoor version or as wall-mounted devices - their thickness in this case is about the same as that of a TV with a liquid crystal screen. For similarity with a natural hearth, manufacturers use various methods to simulate a burning flame or glowing coals - the most realistic is the OptiFlame effect, which uses air-blown silk ribbons with a special backlight. 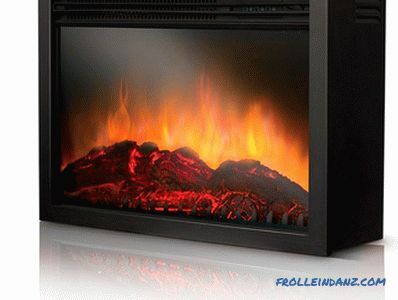 Additional advantages of electric fireplaces are the possibility of using a thermostat that automatically controls the temperature in the room, as well as air filters that trap dust particles with a size of up to 1 micron. The last function was appreciated by allergists and simply by those buyers who monitor the cleanliness of the air in the room. 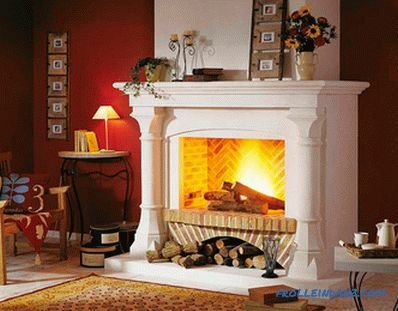 These fireplaces use such fuels, which in the process of combustion practically do not emit carbon dioxide (bioethanol or ethyl alcohol), so they do not need a chimney, and to maintain the flame is enough air that enters the room through normal ventilation. 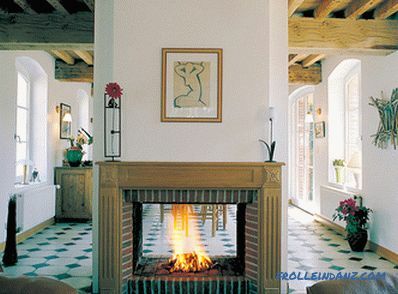 For full heating of the entire building, the capacity of such fireplaces is not enough, but they are an effective addition to the main heating. Firstly, it is the presence of living fire, and secondly, all 100% of the thermal energy that is obtained when it is burned is spent on heating the room, without loss of heat, which in ordinary hearths goes through the chimney. 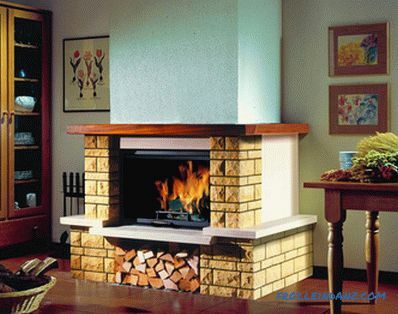 Usually such fireplaces are made of small size and are either built into the wall or installed in an open way. The design and shape of such devices is ideally suited to modern interiors such as "modern" or "hi-tech". 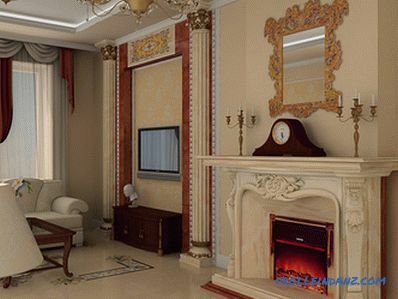 Another advantage of them is that it is almost the only permitted types of fireplaces for the apartment, which use live fire. Heating duration Heating occurs only at the time of combustion, about 6 hours. There are cyclic (5-8 hours) and round-the-clock burning. There are heat accumulating varieties. About 8 hours. Only during work. Only during the burning of the fuel, the burning duration is 1 kg. - 2-5 hours. Heating Area, m 2 Not more than 40. From 60 to 300. From 40 to 60. To 25. To 15. Power, kW From 6.5 From 6 to 30 From 4 to 6 In heating mode to 2, in simulation mode - 0.04 About 2. Where they set As a rule, in private houses. Perhaps in the apartment where there is a chimney. Usually in private homes. Perhaps in the apartment where there is a chimney. In private homes. In any room. In any room. 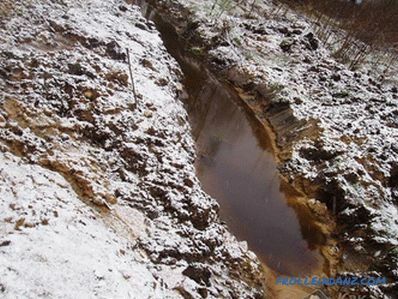 Need for coordination with the fire service Required. Required. Required. Not required. Not required. 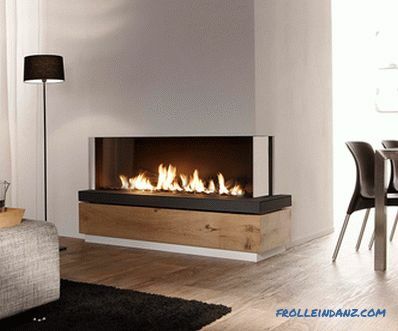 According to the installation method, the fireplaces can be divided into built-in, wall, corner and island ones. Each of these solutions has its own advantages and disadvantages and the choice of any of them depends on the availability of space in the room and interior preferences. 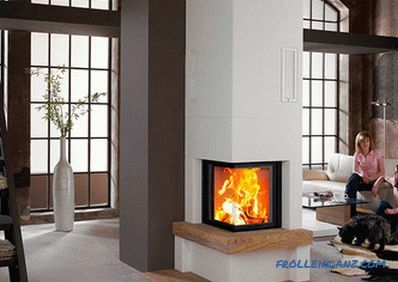 The most economical option in terms of occupied space - such models are built into the wall or made in the form of a column, the lower part of which is a firebox, and the upper one is a chimney. 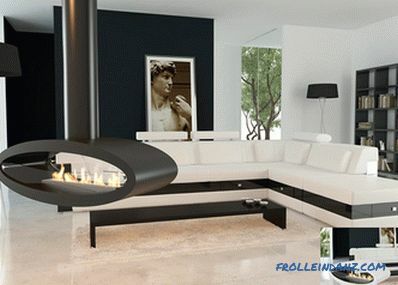 In terms of installation, this fireplace is good if its design is already incorporated in the project of the house. 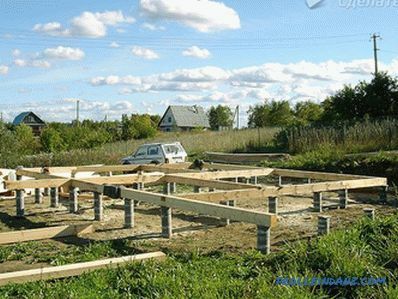 Otherwise, the installation will require cutting the walls for the hearth itself and additionally laying the chimney. 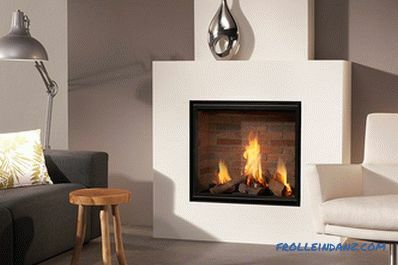 In this case, it is far from a fact that everything will be done exactly in the place where you want to install a fireplace. If the wall thickness is insufficient, the labor costs may be greater than in the case of mounting a model of another design. This model is not suitable for rooms of small size, since all its elements are located in a room near the wall. Considering that it is additionally required to construct a refractory overlap, the entire structure fully supports the contour of the wall. 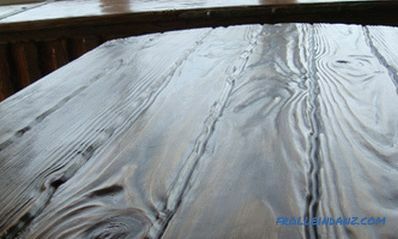 Despite its size, the wall model is one of the most common for heating with wood or gas, since its design allows installation in an already constructed house. The ways of exterior decoration are not limited by anything - it uses brick, various types of stone or ceramics. The main advantage of such models is the original design, but in terms of energy efficiency, they significantly lose to other types of fireplaces - their heat output is about the same like a divorced campfire. 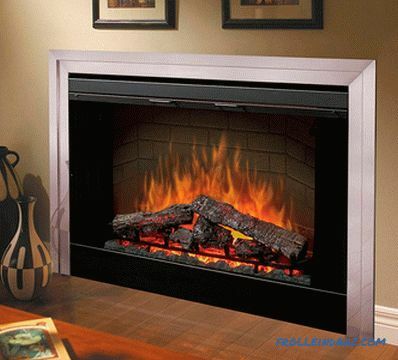 Island fireplaces are structurally a heat-resistant platform made on top of a standard floor covering. 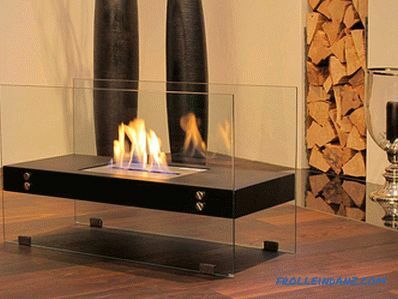 Its perimeter is made with or without glass fences to create the effect of fully open fire, but in the latter case, handling the fireplace requires increased caution. A smoke collector is mounted above the hearth, which connects to the chimney. The overall dimensions of the whole structure are large enough so that it can be used without hindrance in small and even medium-sized rooms, which must be considered before choosing your choice. 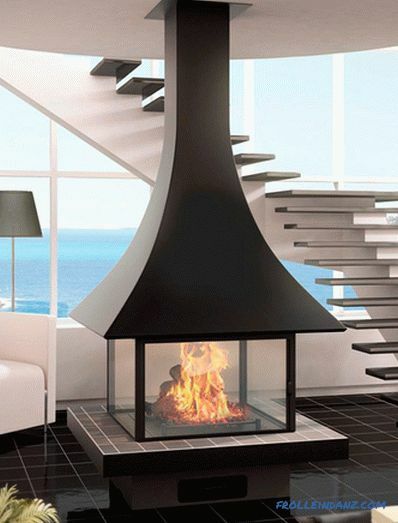 In addition, there are island fireplaces that are suspended in a room and not in contact with the floor. They have a special design and are often used in the interior made in the Scandinavian style. 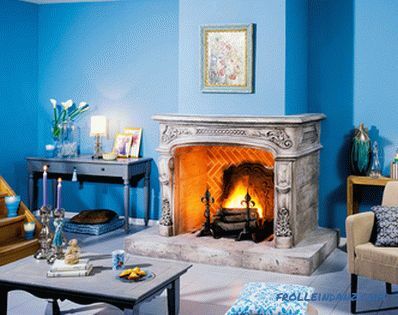 By right, these types of fireplaces for the house are considered one of the most beautiful and popular. 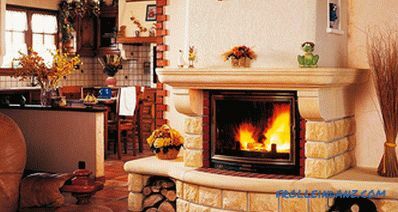 The advantages of this solution in a smaller amount of occupied space and a more convenient location - in the corner of the hearth in any case does not interfere with the movement around the room. 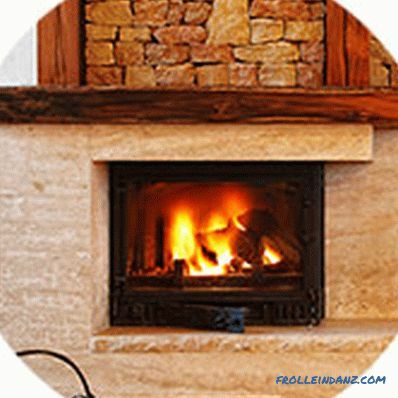 When building such a fireplace, a chimney can be placed on any of the walls to which it adjoins, and the walls of the combustion chamber are made either in the old way - an inclined shape, or a more modern solution is used - a two-chamber firebox. 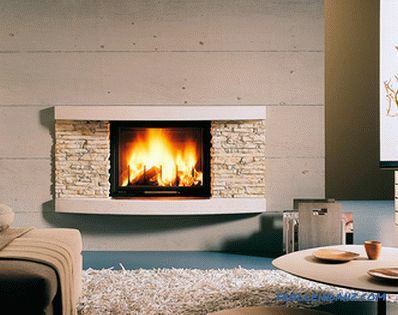 The angular arrangement of the fireplace has almost no effect on the possibilities of its design: there can be used concrete, stone, brick — everything, just like in other types of fireplaces. Here the main difference lies in the number of sides, where the hearth gives off heat from the firebox - only in front of itself or in different directions. It can be said more simply - the number of sides of the fireplace is determined by the number of places from which fire is seen in the firebox. 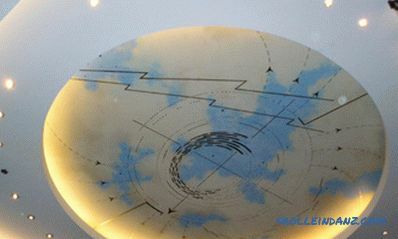 This is the simplest and most common design, which is characterized by high heat transfer due to the inclined walls of the furnace. They reflect the heat energy received from the fire, which is displayed through the main window of the firebox and warms up the room. Such fireplaces may include corner, island and some wall models in which two adjacent or opposite sides of the fire chamber are transparent. The chimney should be designed for more traction, because the fuel will burn faster. Accordingly, the room will be increased requirements in terms of ventilation. Since there are fewer reflective surfaces inside the firebox, the amount of heat that enters the room decreases accordingly - less energy efficiency of the structure. Such a fireplace has not one, but two sides, for which it is necessary to ensure that a glowing ember does not fall out of them. Accordingly, there is more floor space that needs to be protected from high temperatures. The floor should be trimmed with insulating layer on three sides. Although the heat at such a hearth diverges in three directions, the main effect is felt only from the central (opposite to the reflecting surface). Low energy efficiency of the fireplace. By architectural design, the vast majority of fireplaces can be classified as belonging to four main types: classic, country, modern and hi -tech. Each of the areas has its own individual characteristics by which they can be easily distinguished from each other. The shape of the portal of a classic fireplace is in the form of the letter "P" and has massive outlines, often with decorations in the form of columns or bas-reliefs resembling them. The material for the portal is most often marble, malachite or wood, and when building a fireplace in the English style, cast iron forged parts are used - gratings, fences, etc. A fireplace made in this architectural style is easy to recognize thanks to the presence of a massive wooden beam in the upper part of the portal and a wide “sole” that gives the whole “D” construction a figurative shape. Literally, the name of the style is translated from English as "province" or "village", which implies the use of simple but effective solutions. 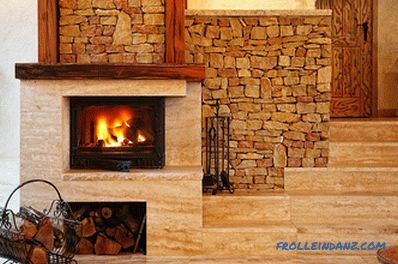 Therefore, as a material for such fireplaces, most often used is a lightly processed, porous, and excellent heat retaining stone - “sandstone” or “shell rock” (in some regions - “shell rock”). The outer part of the chimney is often finished with gypsum materials that are easily processed and do not require a long hardening. The design of such fireplaces is based on the solutions used in the classical style, but to give them a quick glance to distinguish them. If the classic looks massive and solid, then the modern foci are often more straightforward, and even if the portal is decorated with bas-reliefs, they create the impression of lightness and fit perfectly into the modern minimalist interiors of offices and residential premises. This is not a mandatory feature, but more often, fireplaces made in the style of "modern" height occupy all the space - from floor to ceiling. 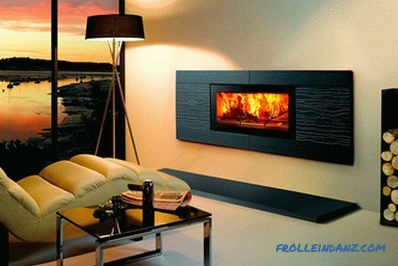 A high-tech style (this is how hi-tech translates) a fireplace can differ from its analogs not only in its futuristic form, but also using new refractory materials. The expansion of industry in processing and compounds in various combinations of glass, metals, periclase, fireclay, concrete and even plain water, led to the creation of fireplaces of the most unexpected forms that fit into any interior. 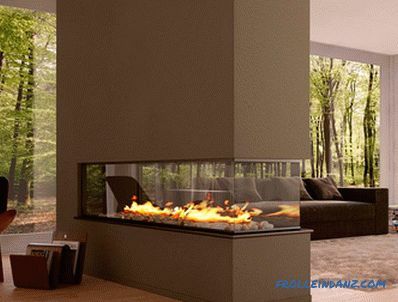 The only drawback that can be found in such solutions is that it is advisable to carefully study the proposed construction - the laws of heat propagation are the same everywhere and the original appearance of the fireplace sometimes affects the efficiency of its work for the worse.